The Better World Showcase, the Faculty of Science and Engineering's social responsibility awards, took place on Monday 12 February in the Great Hall. The event celebrated staff and students who are ‘making a difference’ through projects which benefit society or the environment. The event was hosted by Professor Martin Schröder, Dean of the Faculty, who praised the number and variety of projects and the commitment of those involved to social responsibility. Many of the judges who presented the awards commented on the high quality of the 45 nominations and how difficult this made the judging process. As a result a number of projects were highly commended in addition to those who won the award in each of the nine categories. In total 20 outstanding projects were recognised. 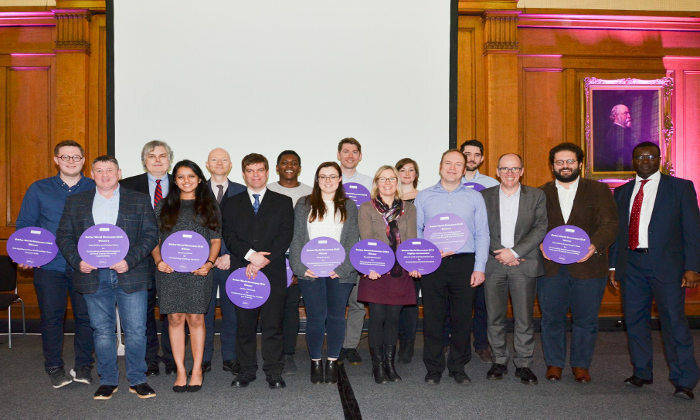 Staff and students from across the University also had their say on their favourite nomination in the People’s Vote, and an additional award was given to the winner of the vote at the celebration event. Rob Appleby and the Tactile Collider team were recognised for the second time for their fantastic work making some of the most exciting and high-profile physics research of recent times accessible to the visually impaired. At the event, posters of all of the excellent nominations were on display for guests to see. Along with the awards ceremony, guests enjoyed afternoon tea as well as performances from the School of Chemical Engineering and Analytical Science’s staff choir and Yusuf Tarajia, a chemical engineering students and award-winning spoken word poet. Congratulations to all of our winners and nominees and thank you for ‘making a difference’. Many of the nominees in the Better World Showcase have been put forward for the University’s Making a Difference Awards and we wish them lots of luck in this process! Photos from the event are available on the Faculty’s Facebook page. See all the nominated projects on the FSE Social Responsibility website.